Water’s qualities of reflection, light, and life have long attracted and inspired photographers. The reflective qualities of water have unusual and beautiful effects on the subjects photographers find in, on, and around the water. Some of those subjects are the animal and plant life found at the water’s edge, and some live in the magical world beneath its surface. Professional photographer Ian Plant demonstrates what gear you will need to wear and bring along on your next water photography expedition. 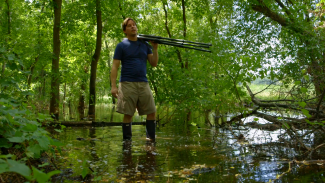 He shows you what effects you can achieve with certain filters, how to keep your camera equipment dry and safe – even if it’s dropped in the water, and how to stay safe yourself. 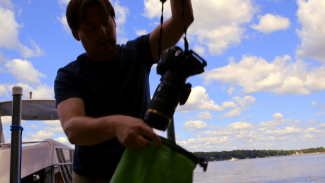 Professional Photographer Ian Plant shows you what precautions to take so you and your camera equipment stay safe while photographing in and around water. You will learn how to protect yourself and your equipment in rising tides, where there are splashing waves, and how to dry out your camera if it gets wet. You don’t have to live on the coast to find a place to take beautiful water photographs. 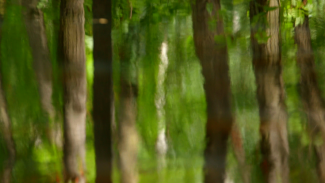 Beautiful water photos can be taken at wetlands, lakes, ponds, bays, lagoons, and creeks, which are everywhere. These bodies of water are teeming with wildlife and plant life that will make dynamic photographic subjects. 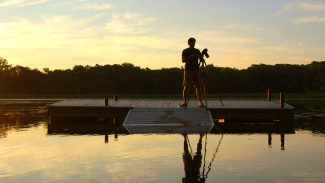 Professional photographer Ian Plant will teach you to take magical photographs of water on the edge of light and at each stage of light as it progresses from first light to full sun at sunrise. You will learn camera settings, which filters to use, and how to get the dramatic results you are after. 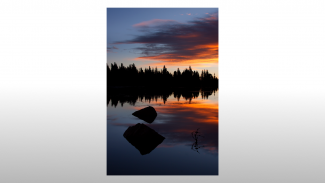 The golden light of sunset and its reflections on the body of water you want to photograph add color and drama to your photos. Learn how to make the most of this colorful light, how to select the best vantage points, and choose elements for your subject matter. 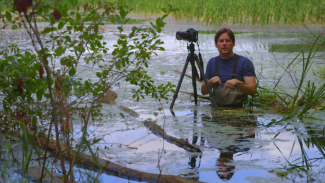 Professional Photographer Ian Plant shows you how to photograph reflections in water, whether the subject is clouds reflected in the water, trees, plants, or wading birds at the water’s edge, or simply the light on the surface of the water itself. 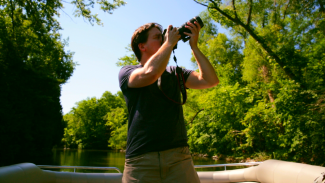 He will give you suggestions on the best ways to capture the photographs you want. Start shooting photos an hour before sunrise so you can see the effects of every stage, from first light to full morning sun. 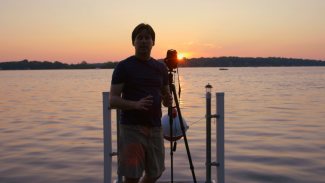 Ian Plant explains how every stage of light creates different types of reflections on the water. Learn how changing the composition and position of the camera as the light moves affects your photography. Composition of your water photographs can vary from wide landscape shots that are half water and half sky, to close-ups of plants reflected in the water, to action shots of animals or crashing waves that convey water’s energy. Keep your mind and your eyes open to the numerous possibilities that are there for you to find.